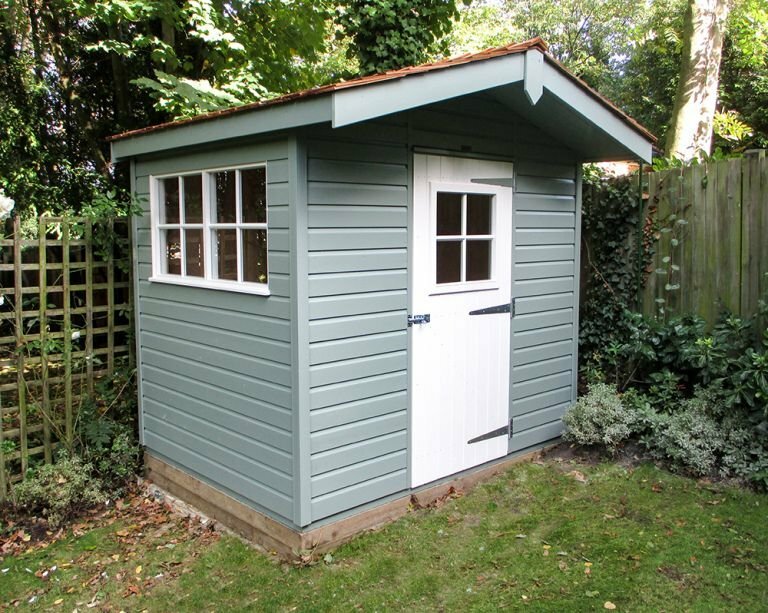 A quaint Superior Shed installed in the back corner of our customer’s garden in Totteridge, London, it is to be used as a small, secluded writing room. Since this shed is only 2.4 x 1.8m in size, the customer decided to have a roof overhang over the front gable to add to the style, as well as to give the impression of a larger building. As well as the roof overhang, the customer really wanted to make an attractive garden building, so they chose to have cedar shingle tiles on the roof, Georgian windows, including one in the door, and a two-tone paint system, with Sage for the walls, and Ivory for the doors and windows. Both colours are from our Valtti paint range. Internally, to help the customer to make full use of their new writing room, they chose to have full insulation, as well as oak faced ply lining. Our superior sheds are robust and ideal for secure storage, a hobby room or a workshop. They are available in a wide range of sizes and are tailor made to your specifications. Based on what you need, we can also add extra features such as electrics. 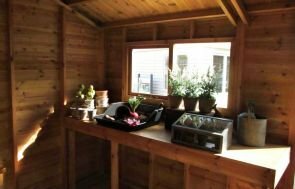 We also offer a variety of roof, window, door, flooring and cladding options so that your shed is unique to your garden. For more information on our garden sheds, follow the link below.